During our original crowdfunding campaign, we successfully raised £3,945 with 79 supporters in 41 days. We are now continuing to accept donations to keep repairs going. Find out more about our original plans below. Kinloch Castle on the Isle of Rum: a really special place. Seen from a distance it looks like it's still OK. 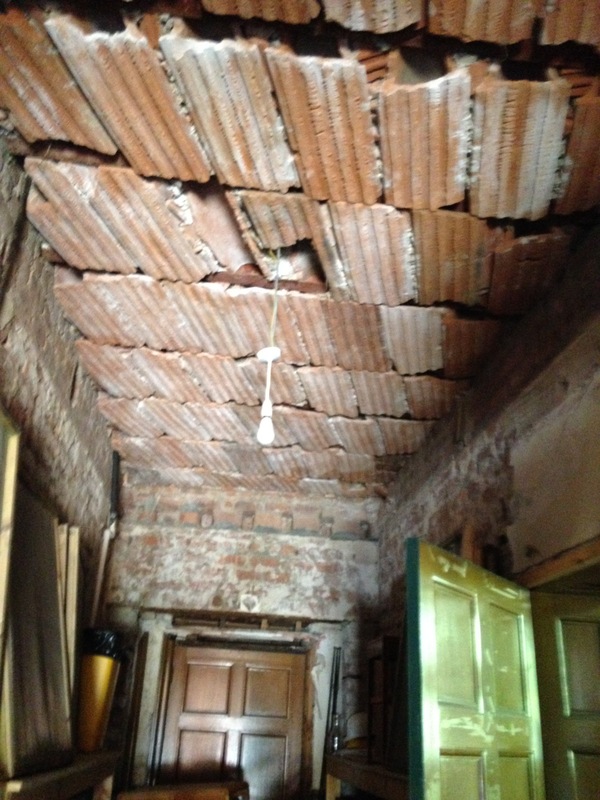 But it's suffering from years of roof problems, dry rot, wet rot, too much light on the fabrics, a whole host of related problems. 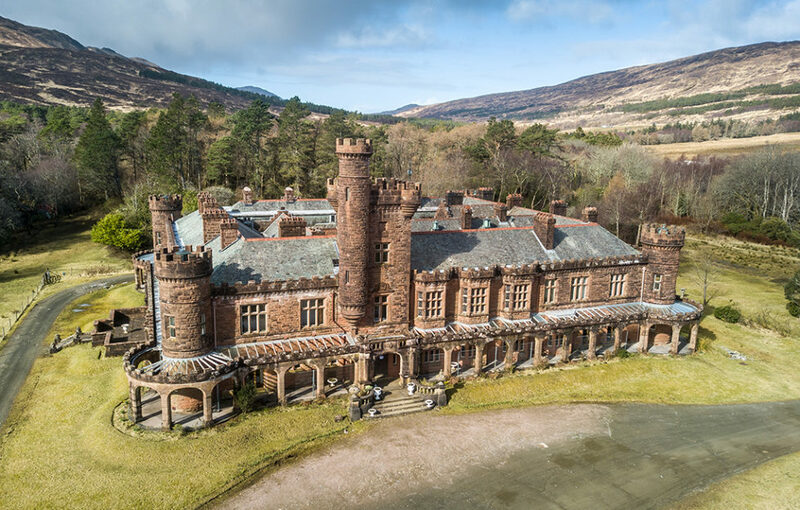 Kinloch Castle Friends Association was set up in 1996 to work towards the restoration of the Castle and are now working for asset transfer so we can give the castle a viable future. The Castle is a Category A listed building and acknowledged as being very special. The Isle of Rum is a National Nature Reserve with the second largest colony of Manx Shearwater, the longest ever study of mammals surveying the deer population, fascinating archaeology, and superb geology but there are not enough places to stay on Rum for all the people who want to visit and we are looking to fill the gap. Visitors want to climb the Rum Cuillins, explore and study the geology, watch the amazing wildlife, visit the castle, and so much more. KCFA aim to make the castle once more full of visitors staying in the quirky bed and breakfast. First though, we need to raise funds to help pay for lots of upfront costs to get us along the road. We've got part way but we need more. Why do we want to do it? The Castle is a very special place - unexpected to find such a building on the very beautiful, mountainous Isle of Rum just south of Skye. Have you heard the Orchestrion play? This fabulous and very rare instrument is fitted under the staircase off the Great Hall. It is one of the biggest versions of a mechanical musical instrument and plays all the instruments of the orchestra using rolls of thick punched paper. The Kinloch Castle Imhof and Mukle Orchestrion has more rolls than any other and they are in better condition, largely because once it was fitted, George Bullough didn't really like it! Hearing the sound reverberate round the hall is one of the extra special features of any Castle tour but sadly it needs restoration after an attack of woodworm and lack of maintenance over the years. The construction of the castle is unusual and the building is still just recoverable. The photo above shows the unusual tiles of the ceiling, usually covered in plaster. This is only one of the special features of the construction. Once you've helped us to achieve asset transfer, we intend offering 'behind the scenes' tours - look out for them later so you too can visit and see what we're working towards and how special this building is. Be part of something special! 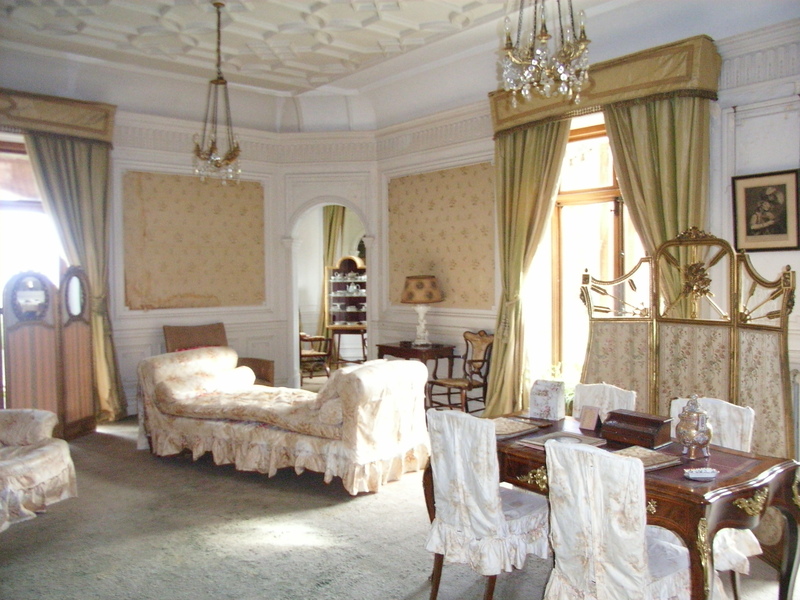 Lady Monica's Drawing Room - magnificent but damp is affecting the wall coverings, light is affecting the fabrics. The Court Room (so called because it overlooks the central courtyard). 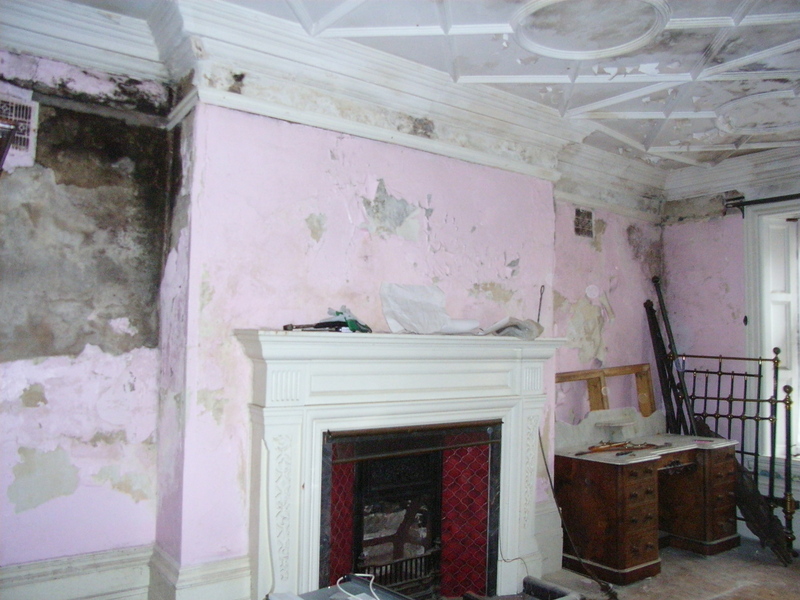 Suffering from mould, damp - you name it! But once restored this will be one of the bedrooms made available for the first time in many years. 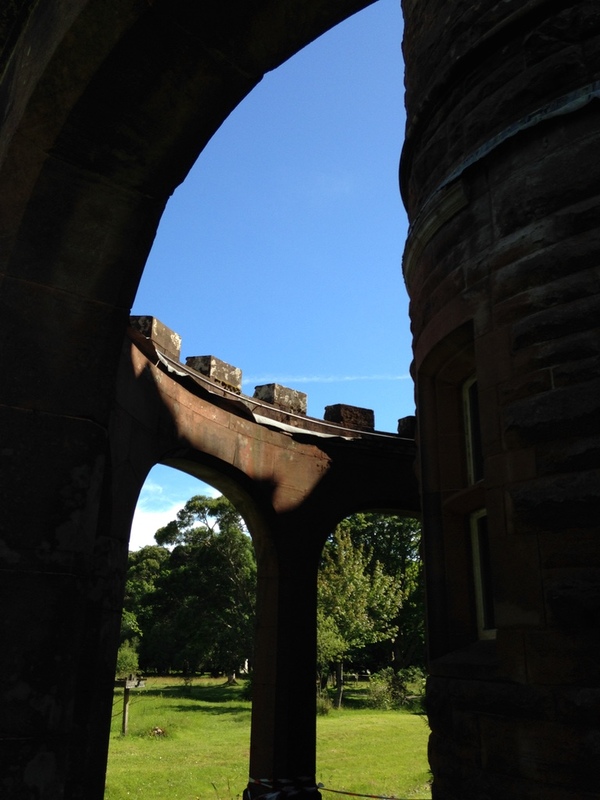 The verandah goes round three sides of the Castle but much of the glazing is broken or missing. reglazing would help keep the rainwater away from the foundations of the building as it should, as well as making it safe to walk round once more. Do you remember Kinloch Castle winning second place on the BBC Restoration programme? Did you ever stay in the castle as hotel or hostel or live and work on Rum? Is it on your bucket list? Do you want to hear the restored magnificent Orchestrion in its original surroundings? 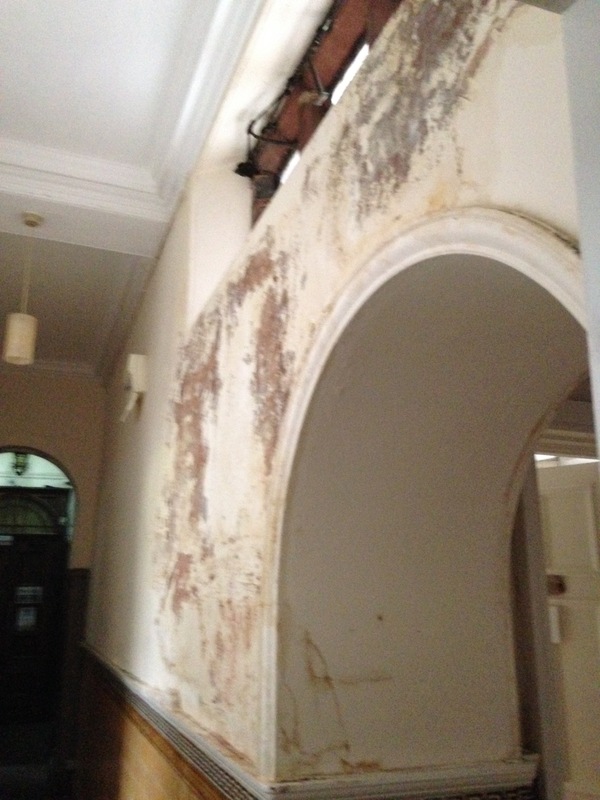 We want to revitalise the former hostel with new plumbing, electrics, showers etc and reopen as soon as possible helped initially by Scottish Natural Heritage, the current owners, then the real fundraising will begin! We have plans to reopen the bar and bistro, both of which will be open to all and then in due course renovate the other special bedrooms so we can hold a variety of events bringing more people to Rum. How do you fancy a murder mystery weekend in an Agatha Christie type environment? A special place for a wedding? An activity holiday including kayaking, wildlife photography, climbing the Rum Cuillins? So much more is planned. Please support us in any way possible and don't forget to Gift Aid if you can! A simple donation will help us to make Rum accessible to all. 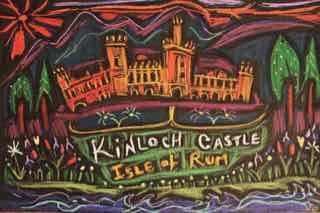 Exclusive print by Jo Sunshine of Glasgow - her view of Kinloch Castle. A quirky fun view of a quirky castle.